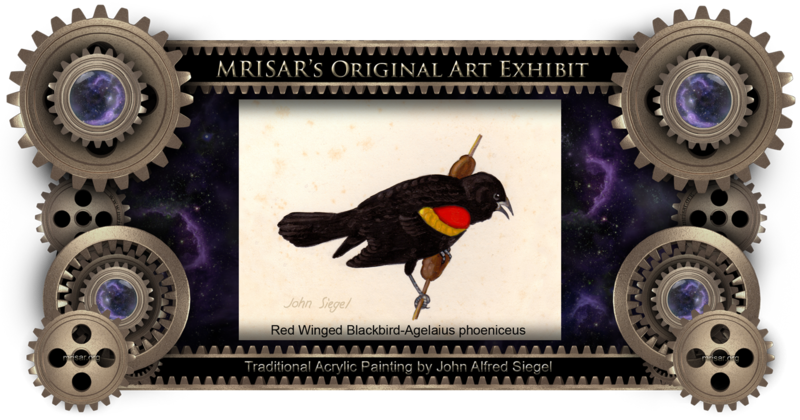 This is an Acrylic Painting of a Red Winged Blackbird - Agelaius phoeniceus; by John Alfred Siegel, an awarded, published and exhibited, multi-disciplined artist and Zoo Keeper and Zoo Display Artist for the Detroit Zoo. He passed in 1988. He is the father of John Adrian Siegel and the Grandfather of Autumn Marie and Aurora Anne Siegel, all members of the MRISAR R&D Team.